Today I found out what the “bee” in “spelling bee” means. Other gatherings that were commonly labeled with “bee” were: apple bee, logging bee, quilting bee, barn bee, hanging bee, sewing bee, field bee, and corn husking bee, among others. Basically, any sort of major competition or work gathering, with a specific task in mind tended to get the “bee” label added on the end. With many of these bees being tedious work events, it was also customary to serve refreshments and provide entertainment at the end of the task. There are a variety of theories as to where this word derives from. It was long thought that it simply came from the similarity between insect bees working together towards a specific task and a gathering of people to accomplish some task. However, this etymology has no specific documented evidence to support it; rather, simply stems from making a logical leap. The popular theory among etymologists today is that it is more likely that the actual origin of “bee”, in the sense of “gathering”, derives from the Old English bēn (prayer / favor). This, in turn, gave rise to the Middle English “bene”, which had more or less the same meaning as bēn except now adding “an extra service by a tenant to his lord”. Finally, this resulted in “bean” meaning “help given by neighbors”. The British dialectic version of this word is then “bee”. The word “spell” comes from the Proto-Germanic “spellan”, meaning “to tell”. The first National Spelling Bee was in 1925 and was sponsored by the Louisville Courier-Journal. At first, they were only going to include contestants from Kentucky, but eventually decided to invite other newspapers to sponsor champions of other states. Nine finalists competed in that first spelling bee in Washington D.C. The winning word that year was “gladiolus”, spelled by Frank Neuhauser. In 1941, E.W. 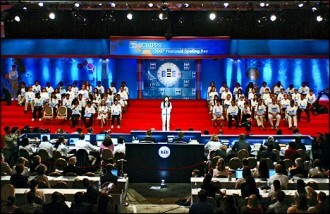 Scripps Company began sponsoring the National Spelling, subsequently changing the name to Scripps National Spelling Bee. Scripps offers a study booklet to prospective contestants that contains around 1000-4,000 words, depending on the year. They also currently offer a list of over 24,000 words that include all words used in the National Spelling Bee since 1950, sorted by frequency of use in the contest. To date, 45 girls have won the spelling bee vs. 41 boys. Co-champions, as illustrated on “Akeelah and the Bee“, have been declared three times, in 1950, 1957, and 1962. The winner of the National Spelling Bee receives several prizes including: $30,000 cash prize from the National Spelling Bee; $5,000 cash prize from Sigma Phi Epsilon Educational Foundation; $2,500 savings bond; a complete reference library from Merriam-Webster; a lifetime membership to Britannica Online Premium Encyclopedia; $2,600 worth of reference works; and a trophy. The second place contestant receives $12,500. Along with the much more famous children’s spelling bee, there is also a senior (50 or older) spelling bee which is sponsored by the Wyoming AARP. In the 15 years that it has been running, the biggest standout has been Maria Dawson, who won in back to back years. What does the bee in spelling bee mean?